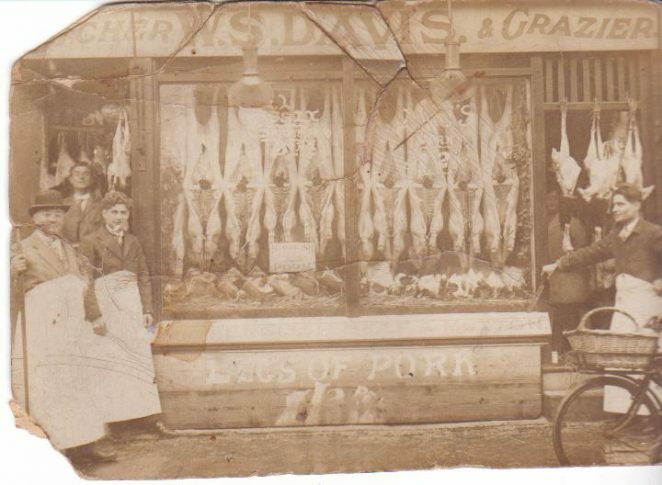 My family ran several butcher shops in Brighton between the wars. My grandfather Frederick Charles Davis had seven sons and three daughters. At least one son, Walter Stanley Walter Stanley Davis also owned his own shops, one in Gloucester Road and another in Gardener Street. My Grandfather was a master butcher. I think one of his shops was in Kensington Gardens. All of his sons worked in the trade: My father Philip Thomas Cole Davis, Arthur Henry, Henry Edward, William Richard (Jim), Francis Albert (Tony) and Charles Frederick (Charlie) I am trying to trace where the shops were. I really would welcome any help you can give. Please leave a comment below. Not much help other than the older photo looks like it’s on a slight hill so I’d personally rule out Kensington Gardens and Gardner Street for that one. My parents’ shop was 101 Gloucester Road, the frontage of which you can see from a photo elsewhere on this site, has a noticeable slope, so I would not think this was that shop. To my mind (and knowing butcher shops clustered) this was somewhere like Sydney Street, perhaps on its corner with Gloucester Road. Just compared the first two of the photos again and beginning to wonder if it was 101 Gloucester after all, but taken much earlier than 1937. The clothing and decay of the print could put it around 1900. Have a look at the print of my parents’ shop on http://www.mybrightonandhove.org.uk/page_id__5736.aspx and consider the 3 factors that are making me reconsider: (1) The folded rolled awning that pulls over the shop. (20 That there is a second door far left which is at an angle suggesting it served 2 streets. (3) That the fascia board over that door continued in a straight line. Hi Roy, I think this photo was taken later than the 1900s, as my dad, who is standing next to my grandfather, with the bowler hat, was not born until 1905. I think he looks to be in his 20s in this photo. The photo is a copy of a copy, so probably looks older than it is. Best wishes. 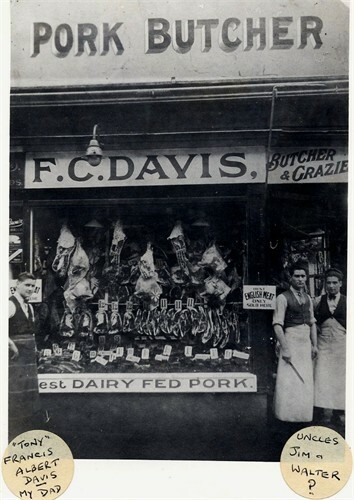 We used to get our meat from this butchers in Sydney Street on Christmas eve, much cheaper. We were poor. Hi Sara I have new email lost yours could you resend please? Hi Sara, Walter Stanley Davis on the right is my grandfather. You are correct – 101 Gloucester Road Brighton. Walter married Barbara Isabella Gillow, my grandmother. Walter also had a shop in Gardner’s Street, Brighton which was next door to my grandmother and they had 25 Gloucester Road then Boundary. I believe Walter’s siblings moved to Australia (except Charlie and Walter).